Reid Richardson is the son of Clara Vining and Wesley Richardson. 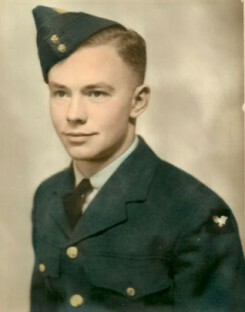 In February of 1942, Reid went to Woodstock, Ontario to enlist in the Air Force so as not to be conscripted into the Army. Up until then, he had worked on his father's farm. Reid was stationed at Mon Joli, Quebec and Dunnville, Ontario where he was trained as an aero-engine mechanic, servicing the Harvard, Anson and Yale aircraft. In Dunnville, the planes were used in pilot training. While there, his wife Jean worked at the Monarch Knit Company. Reid was later sent to England, crossing the Atlantic in a boat named the "Athalone Castle" that had been used before the war as a banana boat in the Caribbean. The voyage was so rough and the men so sea sick that they were barricaded in so that no one could jump overboard. Reid says that he survived the 15-day voyage eating only 43 chocolate bars as nothing else would stay down. The ship landed near Liverpool and was immediately condemned as a troop ship because it was in such poor repair. Reid was later posted to Northern Ireland where he worked serving Lancaster Bombers. After the war, the Bombers were used to fly food into Germany from Ireland in support of the army occupation of Germany. The trip home took only five days to cross the Atlantic, this time on a ship named the "Elde France." They landed in Halifax, Nova Scotia in March 1946 and Reid took the train home to St. Marys, Ontario where his wife Jean and family were waiting at the station. Following the war Reid and his brother Eric ran a car business in St. Marys, Ontario called Richardson Motors. Reid and his brother Eldon purchased Lakeside Danceland in 1960 and ran it for several years. Four generations of his family enjoy their cottage at Lake Sunova, Lakeside, Ontario which was purchased in 1948.